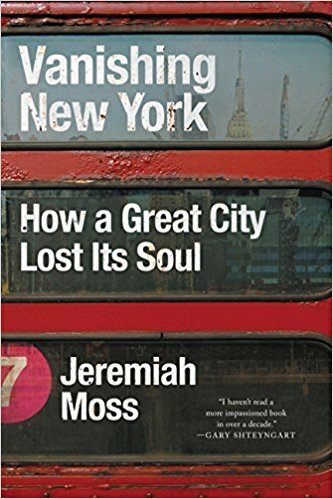 In Vanishing New York, Moss reports on the city’s development in the twenty-first century, a period of "hyper-gentrification" that has resulted in the shocking transformation of beloved neighborhoods and the loss of treasured unofficial landmarks. 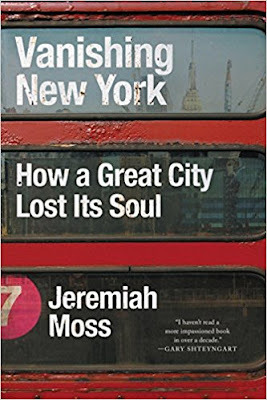 Moss has emerged as a Jane Jacobs for the digital age, known as one of the most outspoken and celebrated critics of this dramatic shift, and the Village Voice described his style as a "mixture of snark, sorrow, poeticism, and lyric wit." Moss writes of when he arrived in New York, "One of the great tragedies of my life was that I had the misfortune to arrive in New York City at the beginning of its end. It was 1993, I was twenty-two years old, and already I was too late. I had missed the city's heyday - the rambunctious punk years of the 1970s and '80s, the beatnik days of the 1950s and '60s, the glorious wartime forties, the radical lefty thirties, the bohemian 1920s and '10s, all the way back to the ur-countercultural era of Walt Whitman carousing and espousing at Pfaff's beer cellar in the 1850s. I missed it all, over a century of the best of New York, thanks to two uncontrollable facts of my birth: its year and geographic location. But we cannot choose our time or place, and I hurried to the city as soon as I could, unaware that the early 1990s was quite possibly the worst moment to get attached to New York. It was like falling crazily in love with a ninety-three-year-old, too blind to see that she was fading. I was Harold and New York my Maude. The city looked so alive - filled with creative vitality, still untamed and rough around the edges. How could I not believe it would last forever? I allowed myself to fall, as if we would have all the time in the world together. "That experience of having missed out, along with its attendant emotional cocktail of anger, grief, and bitter disappointment, surely helps drive everything I write on New York and its vanishing. On this topic, I am not dispassionate. I am biased and prone to nostalgia...New York deserves preaching and anger, romance, and nostalgia. It deserves a passionate, furious defense." In this part, Moss writes about the evolution of the Bowery, "With great fanfare, on an April night in 2008, menswear designer John Varvatos, the inventor of the boxer brief, opened his high-end fashion boutique on the Bowery. The arrival of such a big-name luxury brand to New York's infamous skid row would have been disconcerting by itself, but what made it sacrilegious for many was Varvatos's bold choice of location. He had moved right in to the hallowed space that had been CBGB. "Two years earlier, after more than three decades of birthing and incubating legends of punk rock and new wave, from the Ramones to Blondie and Talking Heads, legendary club CBGB had shut its doors. "Just three months after Kristal's death, and just one year, almost to the day, after CBGB's final night, John Varvatos announced he was moving into the club's space. His press release declared, 'Varvatos Rocks the East Village,' insisting that the boutique, with its rock-and-roll theme, was the ideal business for the sacred space of noise, scum, and rebel youth. With his 'real reverence for the history of the space,' explained the marketing materials, Varvatos would preserve CBGB, curating a cleaned-up version by securing a portion of its graffitied walls behind Plexiglas and selling pricey vintage records alongside the fashions. He made the most of the new Bowery as a brand for luxury grit, developing a line of high-priced Bowery everything - Bowery Boots, Bowery Jeans, Bowery Sunglasses. He sold used rock T-shirts too, the kind you find at church basement thrift shops for a buck apiece. Only these were vintage. That old Ozzy Osbourne T-shirt you throw on to clean your bathroom? It went for $350 at Varvatos on the Bowery."